I got a start on my kit yesterday, a little slower than I was thinking but it's a start. 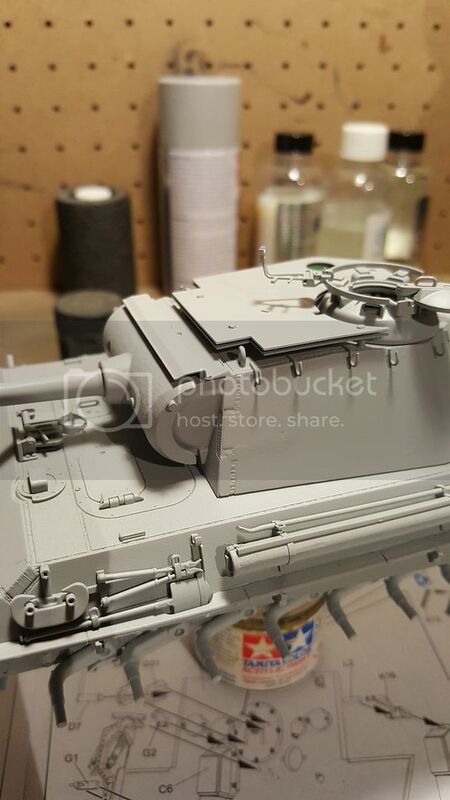 I'll get more done today, hopefully I'll get the turret to the point that it's waiting for paint. Time to start this campaign. 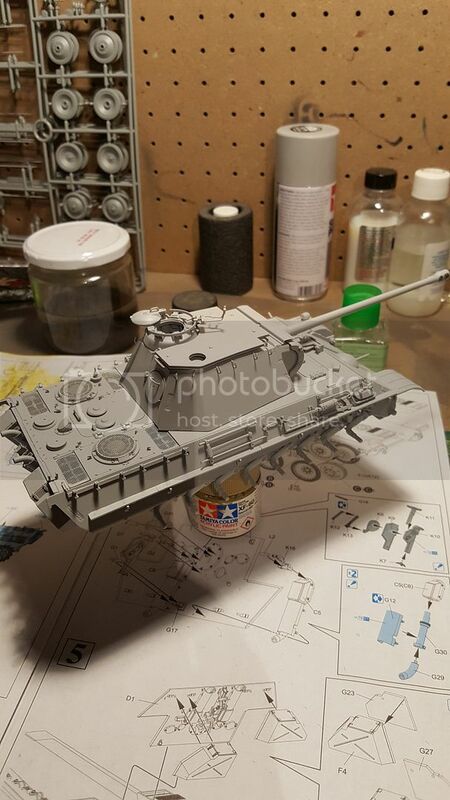 I'm going to be building the Tamiya Tiger 1 Early version. Will be built OOB. 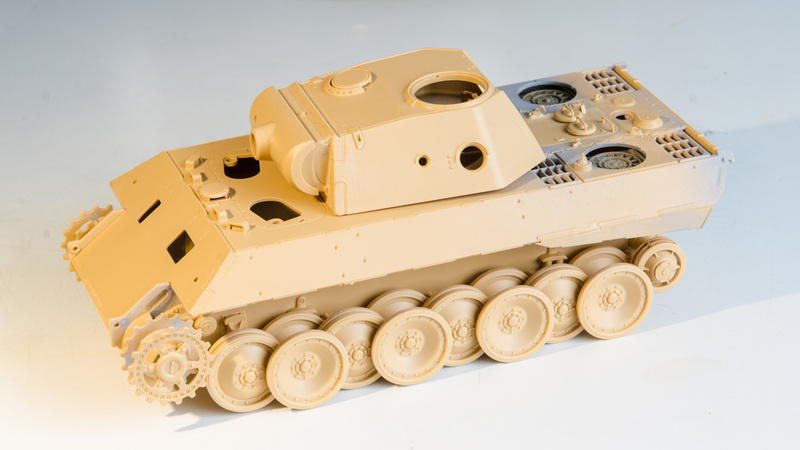 I'll build it as the Tunisian captured Tiger 131, as it is the most accurate based on the kit parts. I will add the missing cross that was on the rear (not identified in the Tamiya instructions). 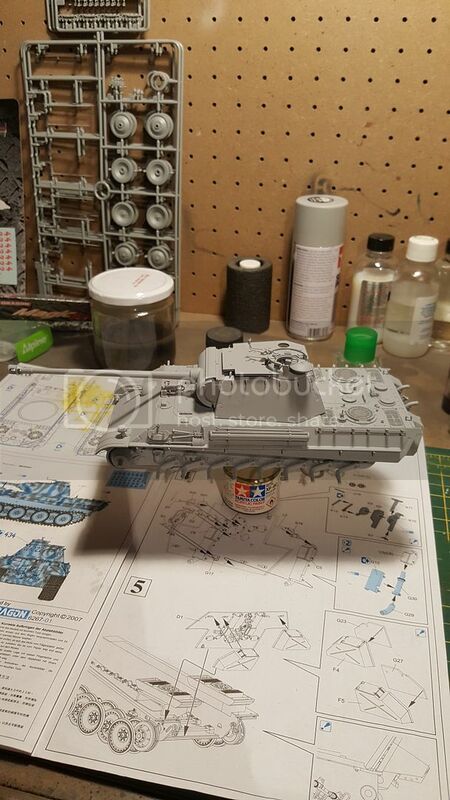 I also plan to use the proper two tone camo scheme (RAL8000 and RAL7008)that the real tank had. 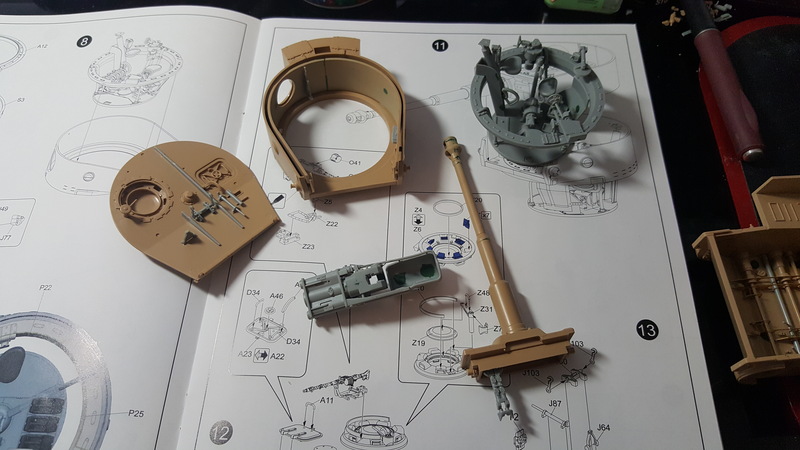 Tamiya instructions call out a single color scheme, which is not correct. Not to go off-topic too much but what F40 motor is that off to the left of the picture? 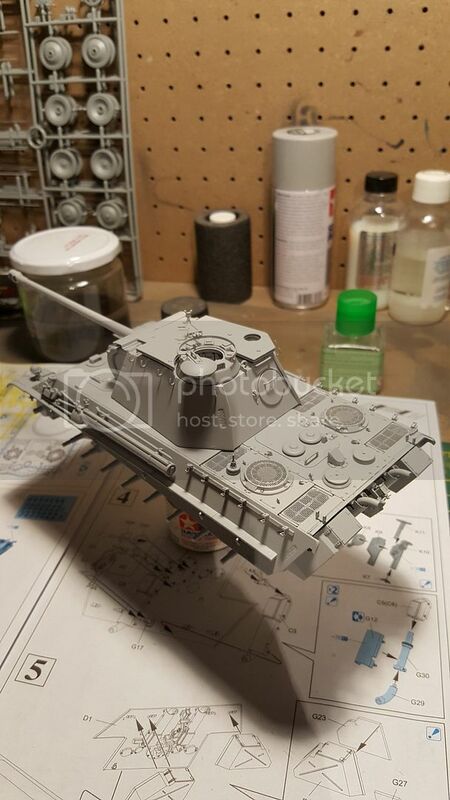 It's from the Fujimi 1:16th scale kit. WOW! I see a lot of really good kits here. I have a question? Here is my progress so far. I am going with the metal barrel and would like to know which glue to use that will give good adhesion. SA or Gator Grip. Anthony, thanks for the comment and glue help. I just primed the hull and am not happy with the zimm. May need to sand a little. It looks good from what I can see. I'm not brave enough to put the zimm on my kit and I don't want to buy the pe sets. I might change my mind though. I'll think on it while I'm building the interior. I still am considering a metal barrel for it, I'm not too happy with the kit barrel. I attached the upper hull and began to attach the smaller items,so far,so good. Anthony, killer looking as always. I always enjoy your builds. which I am also doing for the 'Battle Damage' campaign (goin' for a twofer). Very cool, Colin. Looking forward to watching that. Bit more progress on this end. Most of the large sections are still loose while I wait for some upgrades to arrive. Turret ready for paint for the most part. Interior tub mostly ready for paint. Next onto the transmission and engine, probably start tonight. 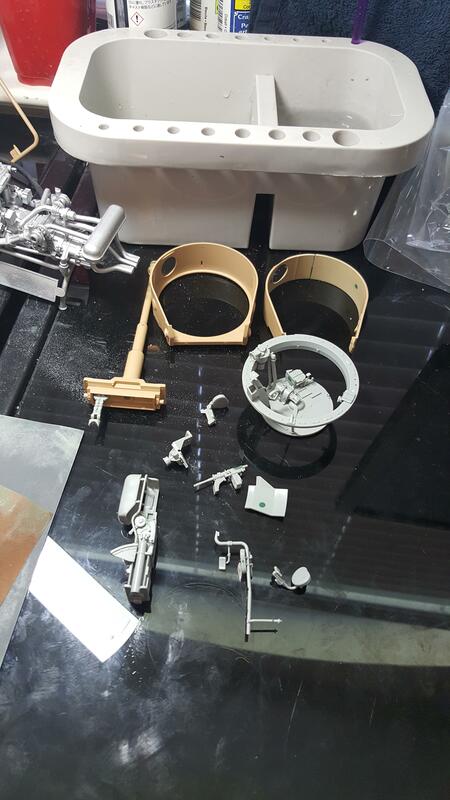 Getting the main parts assembled before priming. Hull is together. And of course a wheel, or two, to clean-up. A little progress on the KT. The bottom picture is the paint scheme I have finally decided on. 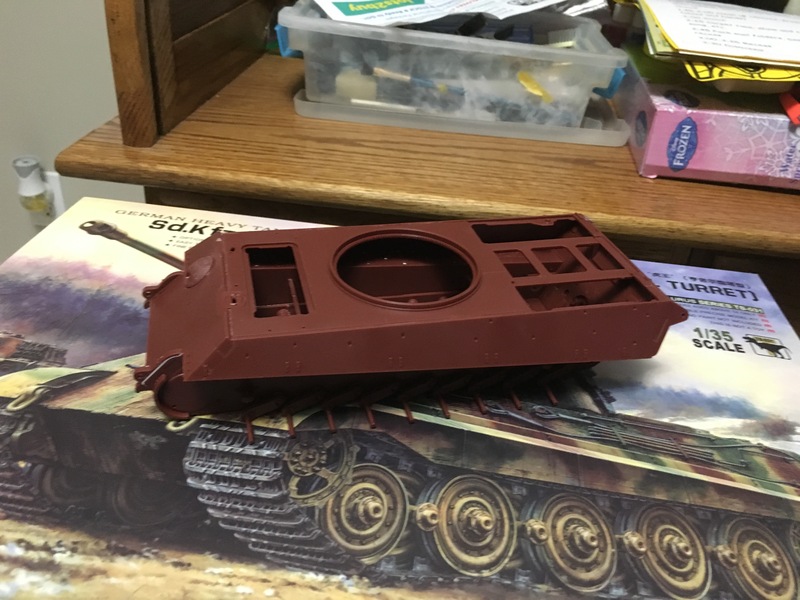 Finally managed to get a start on my Dragon #6232 'King Tiger-Late Production' and working on the lower hull. 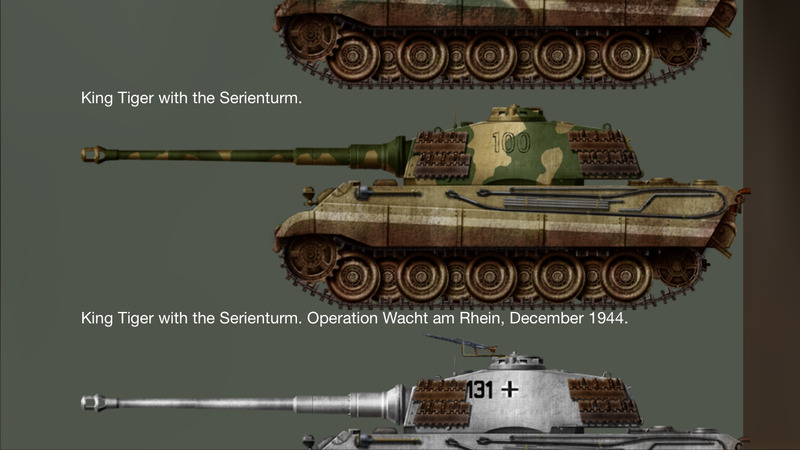 I'm using the 'Magic Tracks' from Dragon #6254 'King Tiger-Battle of Bulge' and 9 tooth sprocket. Also decided to go with an 'Orange Hobby' 88mm KwK 43 L71 barrel instead of the kit aluminum one for the nicer looking muzzle brake. 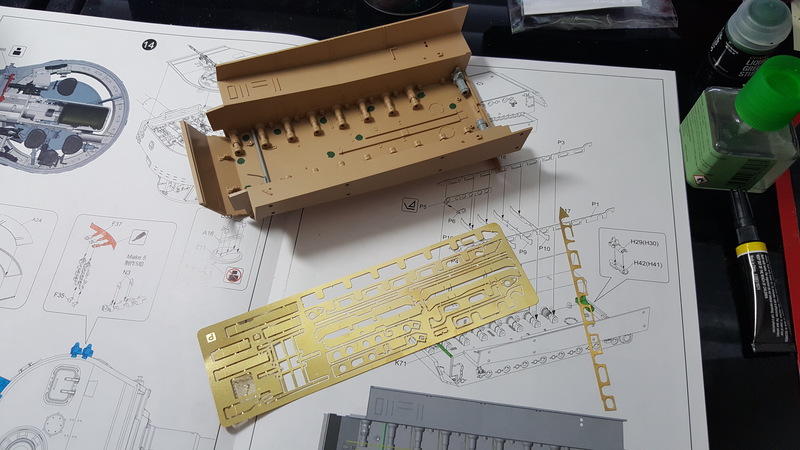 If anyone is interested in the Kit's 'single link' late tracks and 18 tooth sprocket and/or the Fallschirmjager figures, I'd be happy to donate them. Just send me a PM. 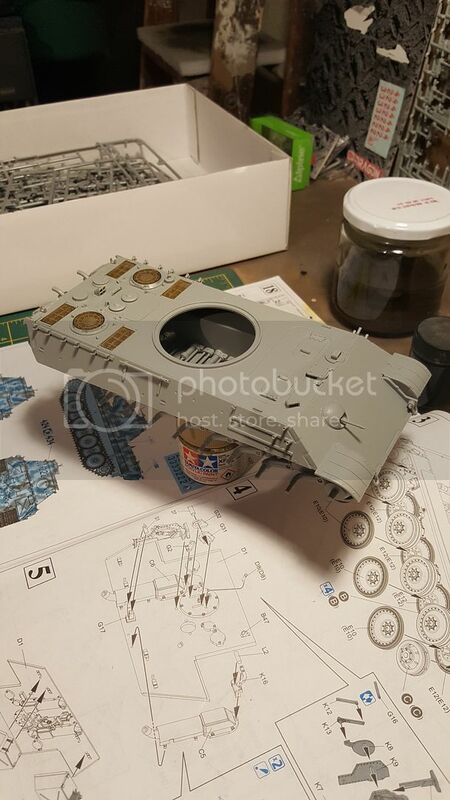 In with Leopard 2A4M Can. Got room for me and my big cat? 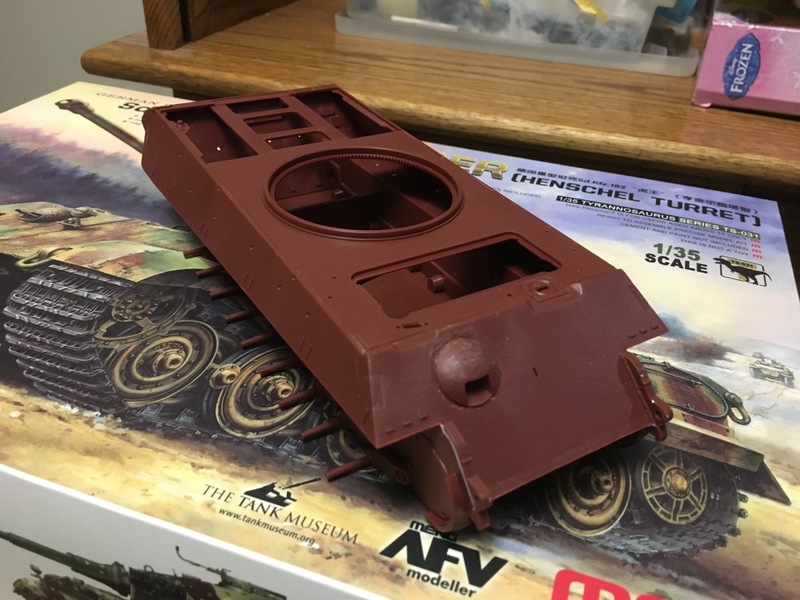 I started a month or so ago, and have been slowly working forward with early assembly and pre-painting. There are still a million parts left, it seems. Every time I need a piece it takes forever to sort through the pile of sprues. So, despite my progress it feels like I have done less than 25% of the complete build. So, I'm enlisting unless you think it's more than 25%. It looks like some nice kits being built for the kitty show. I'm off to a slow start because of a problem. 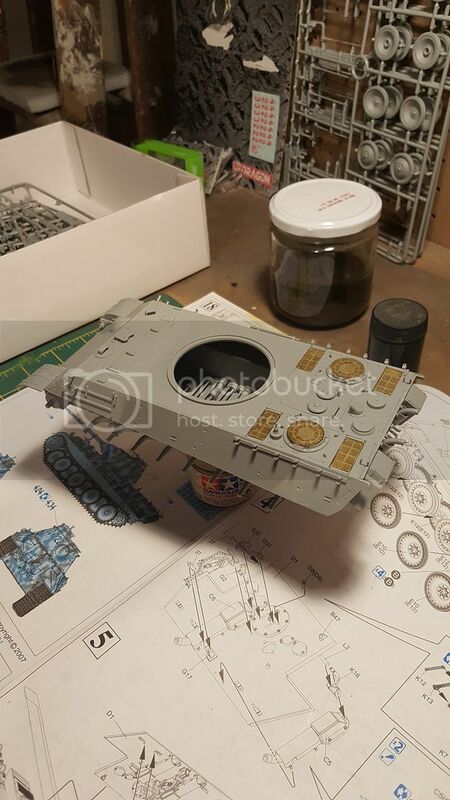 I began my build and have discovered that my Leopard 1a5 kit is actually a Leopard 1a4. Not a huge deal, but I'm having to rethink the build a bit. I should have caught it before but I didn't. I'll probably still go with some of the same elements I was planning to add to the what-if vehicle. 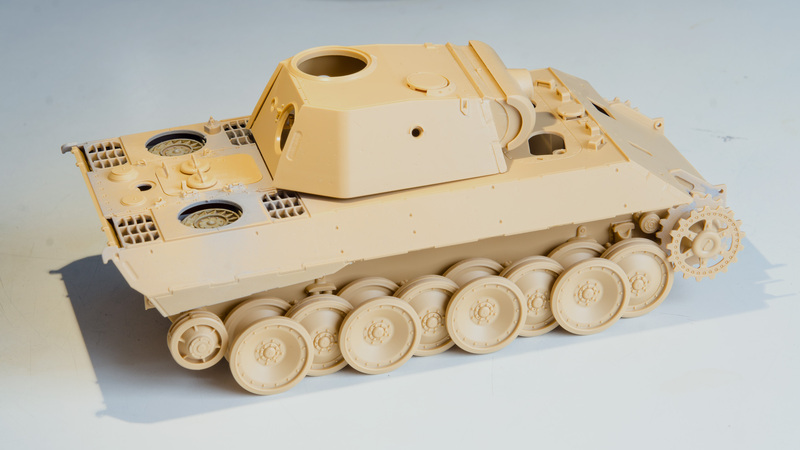 I probably won't go with the 120mm gun though. I hope to really get started this weekend. Fantastic work everybody! Please keep it up! I love these Big Cat campaigns and will probably continue them on in the future, because everybody always pumps out some very nice work. Anthony, that Panther is looking great and you made short work of it. Gaz, yes sir please do join! Can't wait to see what you do with that Big Cat! Thank you to everybody for making this campaign awesome. Turret is modtly done, have to add proper weld beads everywhere as the kit ones are very sunken. Turret shot damage added and painted interior black as it is burnt out (won't really see anything anyway).